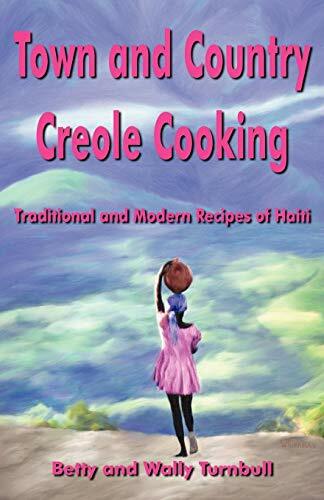 Town and Country Creole Cooking: Traditional and Modern Recipes of Haiti is a collection of recipes for the best of Haiti's cuisine from the rustic fritters sold along the street to refined lobster dishes found in the country's leading restaurants. The straigtforward directions and simple format make the cooking experience as easy as possible, while striving to maintain the authenticity of Haitian cuisine. Town and Country is loaded with extras and variations that make it a cook-friendly recipe collection. Included are charts that list the names of foods in French, Creole and English. The book is seasoned throughout with Haitian proverbs that show great wisdom and a delightful sense of humor. Wally Turnbull received his BA in Psychology from Rockford College in 1970 and his MFA in photography from Ohio Univeristy in 1972. He was born and raised in Haiti where he resided until 1963 when he left to pursue his education. He returned to Haiti in 1972 with wife Betty and has since worked in rural education and self-help. In 1978, Turnbull received a Diplome de Citation from the Haitian Government Department of Education for his work in rural education. He also received an award of distinction from Rockford College in 1983 for his humanitarian work in Haiti. The couple has three children, all of whom were born and raised in Haiti. Betty Turnbull earned her degree in education from Rockford College in 1970. With her husband, Wally, she served as a missionary in education and self-help development with the Baptist Haiti Mission from 1972 to 2002. During her 30 years of service in Haiti, Turnbull developed the first rural preschool program which, today, has expanded into hundreds of schools across that nation, following the model she established. The Mountain Maid Self Help Project Turnbull helped establish continues to provide training and income to over a thousand families in the mountains of Haiti. Turnbull received an award of distinction from Rockford College in 1983 for her development and education work. The author and her husband currently reside in Durham, NC. They have three children all of whom were born and raised in Haiti.